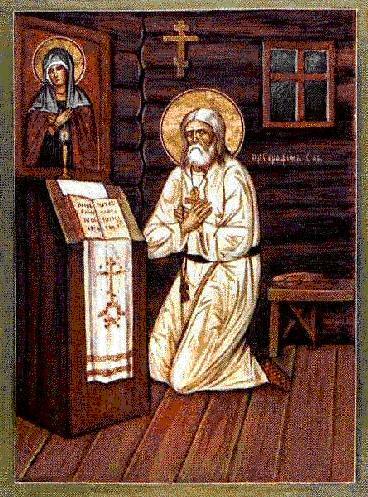 A lifelong intimacy with God, and an abiding Christian love for his fellow man, were two of the many attributes of a man of Sarov, Russia, known as Seraphim, who attained sainthood in the eighteenth century, a century in which far fewer saints were selected than in the early centuries when being a Christian meant risking one's life. A visionary of near divinity and a clergyman of rare compassion, Seraphim's piety was such that he has been linked with Sts. Theodosios and Sergios as the three greatest saints born of Mother Russia. A native of Kursk, Seraphim, who was baptised with the name of Prokhor in 1759, was the son of a devout Christian woman named Agatha and a hard-driving man named Isidore, a successful building contractor. Seraphim's father met an untimely death while in the process of erecting the Cathedral of Our Lady of Kursk, leaving the widow and her ten-year-old son to see to the completion of the church. The boy fell from a scaffolding and recovered from what appeared to be fatal injuries, after which he revealed that in a vision while he lay stricken the Virgin Mary appeared to him with the message that he would survive. This vision, the first of many intimacies with God he was to experience thereafter, was the inspiration which set him on his lifetime course of service to the Lord. While yet a boy, Seraphim turned to the Holy Scriptures, impressed particularly by the writings of Sts. Anthony and Pachomios of Egypt, whose monasticism fascinated him, and, after absorbing the teachings in the works of St. Basil, St. Makarios, and St. John of the Ladder, he entered monastic life at the age of eighteen. Tonsured a monk in 1786 and given the name of Seraphim, he was ordained a priest in 1793 but chose not to preach until he had acquired a greater proximity to God, which he thought could come only through prayer and meditation in the complete solitude of the wilderness. The forbidding forest was to be his home for the next several years. At one point, he broke off his sporadic contact with the monastery and took up residence on a stone slab, on which he is said to have remained for a thousand days and nights in emulation of St. Symeon, removing himself from his uncomfortable roost only for the bare essentials of life. After this,test of spiritual and physical endurance, he sought the comparative comfort of a hut, from which he would emerge from time to time to tell of his visions, in which he had the company of the apostles Peter and John and occasionally the Virgin Mary. Returning to the monastery, Seraphim had grown to such spiritual stature that he was visited by countless pilgrims seeking the way of the Lord, and was ultimately designated as the spiritual father of the nuns of the Diveyev Convent, an order which attested to his power of healing through Jesus Christ and offered its prayers to him when he was recognised as a prophet of the Lord and named a holy Starets (Elder of the Faith). It was his firm belief that the Kingdom of God was within us all and that only through the Holy Spirit could come the joy of complete tranquility and the inner peace which comes with faith. His sermons on this particular theme brought the true meaning of God's love to all those privileged to hear him. Even the animals of the forest came to know the friendship of the gentle Seraphim, and he would on frequent occasions seek out the solitude of the wilderness, returning to the monastery always with renewed faith and closeness to nature that refreshed the spirit. Whenever he became ill, he relied on his "joy," the Virgin Mary, to restore his health. This association with the Divine was to manifest itself many times over. One of the most notable expressions of the power of healing through Jesus and Mary came about when Seraphim was called upon to help his friend, Nicholas Motovilov, a wealthy benefactor who had been paralyzed by a stroke. The prayers of Seraphim were answered and his friend was healed. The true compassion of Seraphim was shown when he obtained the release of three men who had looted his hut, which they mistakenly thought to contain treasure. He died kneeling in prayer in 1833, and seventy years later was made a Saint.